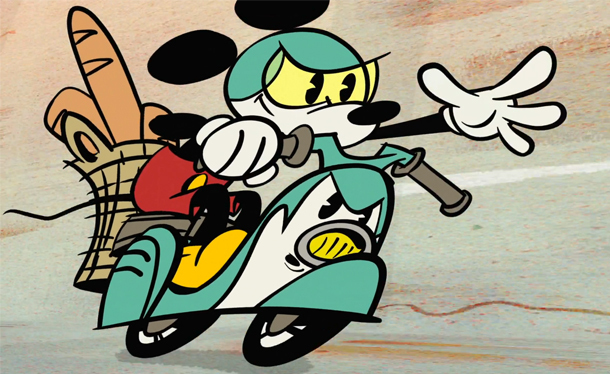 Disney's very own mascot Mickey Mouse will soon be starring in a new short-form series of 2D comedy cartoons. With a style harkening back to the classic Mickey toons of the 1920s and '30s, each short will find Mickey in a different contemporary setting -- Santa Monica, New York, Paris, Beijing, Tokyo, Venice, the Alps and others -- facing silly situations, a quick complication and an escalation of physical and visual gags. The shorts will also feature other Disney favorites like Minnie, Donald, Daisy, Goofy, and Pluto. "By bringing Mickey's comedic adventures to life with vitality, humor, inventiveness and charm, the entire Disney Television Animation team of artists, animators and directors have worked to capture the essence of what Walt Disney himself created 85 years ago," said Gary Marsh, president and CCO of Disney Channels Worldwide. Emmy Award-winning artist and director Paul Rudish (Dexter's Laboratory, The Powerpuff Girls) is the executive producer and director. Aaron Springer (SpongeBob SquarePants, Gravity Falls) and Clay Morrow (Dexter's Laboratory, The Powerpuff Girls) are directors, and Joseph Holt (The Powerpuff Girls) is the art director. The series is produced under the supervision of senior vice presidents Eric Coleman and Lisa Salamone at Walt Disney Television Animation (TVA). The 19-episode project will debut Friday, June 28, on Disney Channel, Disney.com and WATCH Disney Channel, among other platforms. This is extremely cute and I love that they are going for unique animation styles and locations. lol Havent seen a mickey short since house of mouse. Love that art style. Omg YES. 1920s Mickey is my favorite design for him, and the people involved have me really excited. I saw it, loved it, want more. Want so much more! Super cool! And really fitting that they set the first short in France, as there's been a sort of animation renaissance going on in France for the past couple years, resulting in some absolutely amazing shorts. Not the case with me. I found that it. Didn't bother me much seeing as they're in France anyway. Loved it. Especially that cameo. Came right out of nowhere. Uh, yeah, they speak french in the short normally. Now we wait for a How-To cartoon with Goofy. I enjoy how they are mixing it up with new styles. I also love how they are making more cartoons. There are not enough Mickey Mouse shorts! I feel that cartoon shorts are great because they are not too long and they leave room for writers and animators to get really creative because nothing has a permanent outcome. These new ones look really cool. I look forward to seeing more.